In the Bennet household, declining any marriage proposal is frowned upon as the opportunity does not come every day. 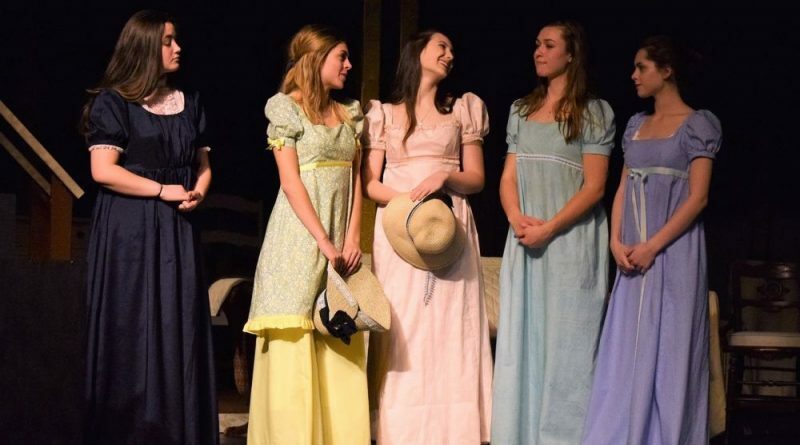 With elegantly executed accents and budding romances, Riverside High School’s production of Pride and Prejudice brought audience members into the day-to-day lives of the Bennet family. Set in England, Jane Austen wrote her well known novel Pride and Prejudice in 1813. Riverside High School’s theatrical version of the novel was adapted by Joseph Hanreddy and J.R. Sullivan. It was first produced in 2009 and has since been performed by high school and professional theaters around the globe. The story focuses mainly on Elizabeth Bennet, the second eldest of five daughters. Unlike her mother and sisters who are enthralled with the idea of becoming engaged primarily for reasons regarding economic security, Elizabeth vows to wait for engagement until someone she truly loves comes along. Autumn Anderson completely sold the role of Elizabeth Bennet, portraying her with an appropriately modest and reserved air. Even when she didn’t have lines to recite, her facial expressions spoke for her character’s thoughts and emotions, such as when she silently read a concerning letter from her sister Jane. Mr. Darcy, portrayed by Jack Gutierrez, bore himself snobbishly in the first act, but then displayed a more affectionate and sweet approach in the second act, altering Elizabeth’s views of him. Gutierrez and Anderson’s romantic connection was innocent, heartwarming, and entirely believable. Brigid Randolph received many cackles from the crowd through her portrayal of Mrs. Bennet. Although playing a maternal role, she would throw hilarious tantrums when things didn’t go her way. Randolph’s commitment to character made her performance much more enjoyable. There to comfort but also playfully tease his wife at any moment was Mr. Bennet, played by Alexander Footen. Both Footen’s spoken sarcasm and sympathetic nature reflected his character’s love for his wife and daughters. Cailor Macintyre stayed true to Jane Bennet’s kindness and gentleness. Macintyre worked with Anderson to establish a clear contrast in their characters’ personalities. Riverside’s cohesive ensemble displayed a commitment to the time period even in small motions such as bows and curtsies to represent a hello or goodbye. The decision to incorporate a unit set called for different lighting colors to decipher the time of day. Actors made use of their two-story set in several scenes, but never drew the focus away from dialogue occurring on the first story. Instead of requiring a crew to complete set changes, the servants quickly moved smaller set pieces and props on and offstage in between scenes. The cast and crew of Riverside High School’s Pride and Prejudice produced an endearing work of art. The hardships that transition to happiness throughout the plot echo the idea that everyone deserves to find true love.